Drain and rinse black beans. Drain corn, green peppers, and onions. 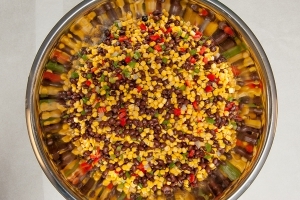 Combine black beans, corn, green peppers, onions and red peppers, in a large bowl. For dressing, combine the lemon juice, parsley, cumin, garlic powder, salsa, and oil. Pour dressing over salad and toss lightly to combine. Place in serving line pans and cover. Chill 2 hours before serving. CCP: Cover and refrigerate at 41 degrees F or lower until ready for service. 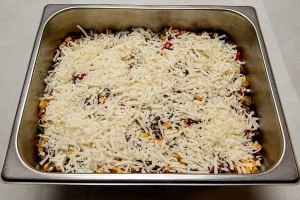 Sprinkle 2 pounds shredded mozzarella cheese on top before serving. Divide the cheese equally among pans. Portion with 4 ounce spoodle or #8 scoop per serving. Each portion provides ¼ cup beans/peas vegetable, ¼ other vegetable. Use USDA Foods foods when available. 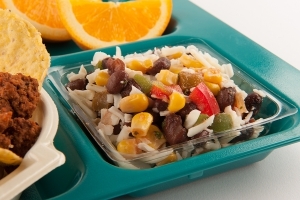 ”Culinary Techniques for Healthy School Meals" provides seasoning and serving ideas for vegetables. 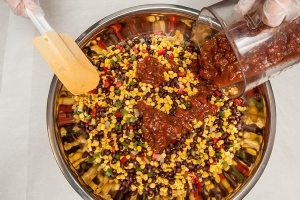 1 serving of Black Bean Salad. This salad is a colorful accompiniment for tacos.